Chancellor Dorothy Leland celebrates longtime UC Merced supporter Fred Ruiz, recipient of the 2018 CASE Fisher Award for Distinguished Service to Education. Fred Ruiz’s support of UC Merced goes back decades and includes substantial contributions through philanthropy, advocacy and service. For his commitment to UC Merced and to education in the San Joaquin Valley, Ruiz has been named this year’s winner of the James L. Fisher Award for Distinguished Service to Education. Ruiz was honored at a luncheon this week in New York hosted by the Council for Advancement and Support of Education (CASE). 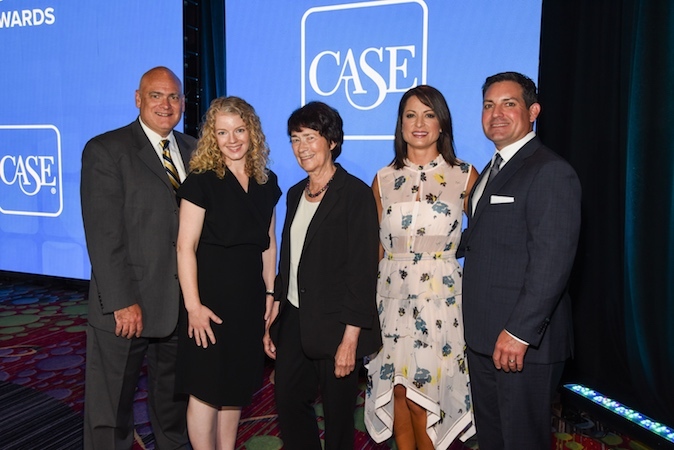 The Fisher Award is one of six Distinguished Service Awards presented by CASE at the luncheon, in conjunction with the CASE Summit for Leaders in Advancement. The awards honor extraordinary service in education and the field of educational advancement, which includes alumni relations, fundraising, communications and marketing. CASE President and CEO Sue Cunningham and Board of Trustees Chair Jim Harris said Ruiz understood the impact UC Merced would make in the region well before the campus was on the map. Left to right: Vice Chancellor Ed Klotzbier, Assistant Vice Chancellor Lisa Pollard, Chancellor Dorothy Leland, Michaela Ruiz and Bryce Ruiz at the CASE awards ceremony. Ruiz, chairman emeritus and co-founder of Ruiz Foods, is a founding member of the UC Merced Foundation Board of Trustees and served as regent on the University of California’s governing board from 2004 to 2016. His financial support to the university includes several endowments, including the Ruiz Family Chair in Entrepreneurship; the Fred and Mitzie Ruiz Endowed Fellowship for graduate students who contribute to diversity; and the Rose R. Ruiz Endowed Scholarship and Fellowship Fund to support undocumented and first-generation college students. In addition, Ruiz was the lead donor in establishing a $1 million UC Merced Foundation Board of Trustees Presidential endowed chair, which will recognize an outstanding scholar at the campus.